Tarsal coalition is an uncommon condition that is often overlooked in the adult population. The potential sequelae of untreated tarsal coalition include changes in gait mechanics, flattening of the longitudinal arch and degenerative changes in the hindfoot joints. Tarsal coalition should be considered as a possible diagnosis in the active younger patient who presents with frequent hindfoot pain and ankle sprains. 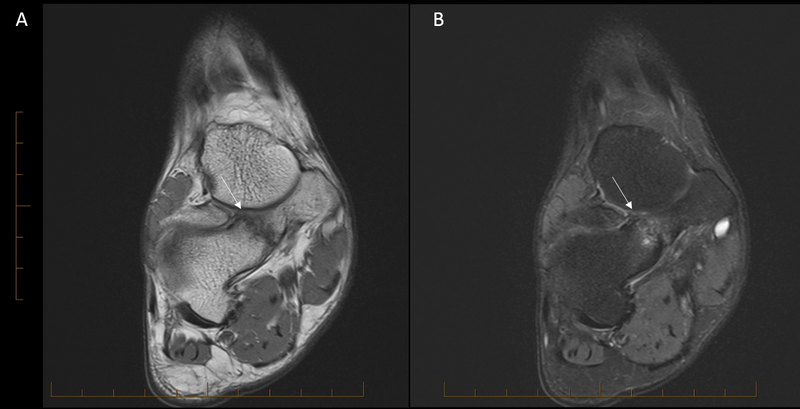 Our report presents a case of an incidental finding of an asymptomatic cuboid-navicular tarsal coalition in a patient who presented with persistent Achilles tendinosis and reviews the available literature regarding this condition. Tarsal coalition, thought to have first been described in the literature in 1877 , is an anatomical anomaly in which a fibrous, cartilaginous, or osseous coalition forms between two or more tarsal bones . This condition occurs in less than 1% of the general population . Approximately 48% of tarsal coalitions are talocalcaneal, 44% are calcaneonavicular, and the remaining 8% occur in other tarsal joints [3,4]. It has been suggested that tarsal coalition occurs during embryonic development due to failure of mesenchymal differentiation and segmentation, and may be genetic in etiology [5,6]. Tarsal coalition is found in association with pes planus, hindfoot rigidity and peroneal spastic flatfoot [7-9]. Imaging evaluation of suspected tarsal coalition should begin with anteroposterior (AP), 45-degree internal oblique, and lateral foot radiographs with the AP and lateral taken weight bearing . These three views are typically sufficient for diagnosis of calcaneonavicular and talonavicular coalition. On radiographs, calcaneonavicular coalition is best visualized on a 45-degree internal oblique, and can present as an “anteater nose sign” on the lateral view . Talocalcaneal coalitions may be difficult to visualize directly due to the complex orientation of the subtalar joint, but are associated with secondary signs such as talar beaking, narrowing of the posterior subtalar joint with poor visualization of the middle facets, rounding of the lateral talar process, and “C sign” created by bone bridging between the talar dome and sustentaculum tali . Additional computerized tomography (CT) and magnetic resonance imaging (MRI) are recommended to visualize the size, location and extent of joint involvement more accurately [11-13]. CT should be reconstructed in both the coronal and axial planes. Non-osseous coalitions may appear as joint space narrowing and marginal reactive bone changes . MRI in the coronal and sagittal planes is recommended to allow differentiation between osseous, cartilaginous, and fibrous bridges . A 23-year-old man began experiencing heel pain three years prior to presentation at our office. His past medical history was negative for diabetes mellitus, traumatic or chronic foot and ankle injuries, or rheumatologic disease. Three years prior to presentation at our clinic the patient experienced acute onset of left heel pain focused around the medial aspect of the distal Achilles following a high-elevation mountain hike. This pain improved with eccentric calf exercises and gentle stretching. However, another alpine hiking activity one year later resulted in onset of pain in the right heel, which did not improve satisfactorily with conservative treatment including gel heel inserts, calf raises and inversion-eversion exercises. The patient began to experience chronic recurrent bilateral distal Achilles pain that varied between 0 and 9 points on a 10-point scale. The patient did not experience any other midfoot or hindfoot pain. The pain was exacerbated with running and improved with rest and diclofenac 1% gel (Voltaren Topical). Four days prior to presentation at our clinic the patient underwent a right hip arthroscopy for femoroacetabular impingement, including labral repair and acetabular and femoral osteochondroplasty. Upon physical exam, the patient was wearing a hip brace and limited to 20 pounds of flatfoot weight-bearing on the right and therefore standing alignment could not be assessed. Bilaterally there was swelling but no tenderness to palpation along the Achilles tendon at the insertion, over the lateral calcaneal ridge, or over the lateral or medial aspect of the tendon. Heel raises were not performed due to his postoperative right hip arthroscopy status. Range of motion of the right ankle with knee straight showed dorsiflexion to 0°, plantarflexion to 40°, inversion to 15°, eversion to 10°, adduction of 15°, and abduction of 10°. Left ankle dorsiflexion with the knee bent was to 10°. Range of motion was equal bilaterally. The patient had 5/5 manually-tested plantarflexion strength bilaterally. Bilateral calcaneal lateral and axial radiographs were obtained. There was no evidence of Haglund’s deformity, calcifications, or fracture. Sagittal, coronal and axial magnetic resonance images of both ankles were also obtained. On MRI of the right ankle, mild longitudinal thickening of the Achilles tendon with increased signal and tendinosis of the distal tendon was visualized. No focal tear defect or retraction was identified. A mild retrocalcaneal bursitis was noted. The cuboid-navicular tarsal coalition was identified on the MRI. The coalition appeared as an osseous prominence of the cuboid-navicular junction, with prominent narrowing of the cuboid-navicular bone junction, and sclerosis, irregularity, thinning, slight pitting, and appearance of interdigitation of the bone margins at the junction. These characteristics are visible both on sagittal (SAG) and coronal non-fat-suppression (COR non-FS) and fat-suppression (FS) images. (Figures 1 and 2). Surrounding bone showed poorly defined increased signal compatible with stress-related edema; this increased signal is most apparent on the FS images (Figures 1b and 2b). Stress-related change and edema were also visualized in the surrounding soft tissue; this increased signal is most apparent on the FS images (Figures 1b and 2b). The cuboid-navicular tarsal coalition appearance, with the narrowing of the bone junction and appearance of bone margin interdigitation and thinning but lack of complete cortical and trabecular bone continuity and marrow bridge, is typical of a soft tissue fibro-cartilaginous coalition or mixed osseous/soft tissue coalition. Figure 1 Sagittal proton density-weighted turbo spin echo non-fat-suppressed (A) and fat-suppressed (B) magnetic resonance image showing coalition (arrow). Severe narrowing of the cuboid-navicular junction is seen with opposing bone margin irregularity, sclerosis, appearance of interdigitation thinning and pitting. Bone and surrounding soft tissue increased signal and stress-related edema are more apparent and prominent on the fat-suppressed image. Figure 2 Coronal proton density-weighted turbo spin echo non-fat-suppressed (A) and fat-suppressed (B) magnetic resonance image showing coalition (arrow). Severe narrowing of the cuboid-navicular junction is seen with opposing bone margin irregularity, sclerosis, appearance of interdigitation thinning and pitting. Bone and surrounding soft tissue increased signal and stress-related edema are more apparent and prominent on the fat-suppressed image. On the left side there were similar signs of Achilles tendinosis and retrocalcaneal bursitis. No tarsal coalition was present on the left side. The patient was made aware of the incidental finding and the potential for the coalition to become symptomatic in the future. The patient deferred treatment of the coalition and elected to manage the Achilles tendinosis conservatively. Calcaneonavicular and talocalcaneal tarsal coalitions are extensively reported in the literature. However, a much smaller number of cuboid-navicular cases have been reported, with varying symptoms at presentation. Current literature suggests that this type of coalition is often asymptomatic, with exacerbation of pain and/or peroneal spastic flatfoot only with increased activity . 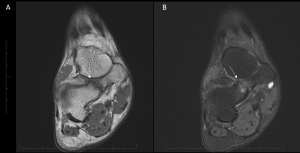 Del Sel and Grand reported the diagnosis of bilateral cuboid-navicular coalitions in a 45-year-old patient who underwent radiographic examination due to trauma to both feet . Chu et al. also reported an incidental finding of a cuboid-navicular coalition upon CT evaluation in a 35-year-old patient following a comminuted pilon fracture . In addition to reports on asymptomatic coalitions, several authors have reported symptomatic coalitions, with symptoms including dorsal and midfoot pain and decreased range of motion [13,14,17,18]. Awan et al. reported a case on a 17 year old patient with chronic unremitting pain at rest that was exacerbated during sports-related activities . Feliu reported a case in which the only symptom was two years of intermittent pain in the dorsum of the foot with otherwise normal findings upon physical exam, while Johnson et al. reported a case on a patient with fixed pes planus deformity presented with midfoot pain associated with a decrease in subtalar and transverse tarsal joint motion [18,3]. The patient age at the time of diagnosis varies from 9  to 45  years old. We found a comparable number of studies reporting male [3,14,15,18,19] and female [4,16,17,20] patients. However, the reported time from the beginning of the symptoms to the diagnosis ranged from two weeks  to several years [3,13,17]. Delayed diagnosis of cuboid-navicular coalitions is often reported in the literature due to missed coalition on radiographic exam. Routine images often show minimal changes with an absence of secondary signs that are seen with other tarsal coalitions and findings specific to cuboid-navicular coalitions . A high level of suspicion must be present in order to correctly diagnose cuboid-navicular coalition, as the only radiographic finding may be an abnormal relationship between the posterior medial cuboid and plantar lateral navicular . Cuboid-navicular coalition does not cause talar beaking, so the absence of the talar beak sign cannot be used to exclude the presence of this type of coalition . Although some case studies reported successful diagnosis using radiographs, [18,19,21] several authors reported negative radiographic findings [3,4]. Fibrocartilaginous and bony forms of cuboid-navicular coalition exist and MRI can be useful in distinguishing between them [3,13,14,16,17]. MRI findings in the context of a bony coalition include a continuous marrow across the coalition bridge . MRI may be superior to CT for the diagnosis of fibrous coalitions as the MRI allows better differentiation between bony and fibrous changes . Furthermore, MRI proton density fat-suppressed (PD FS), T2-weighted fat-suppressed (T2 FS), and short T-1 inversion recovery (STIR) images allow visualization of reactive edema . Different stages of coalition ossification may exist in a single patient. For example, Del Sel and Grand and Piqueres et al. reported cases of bilateral cuboid-navicular coalition, with an osseous coalition on one side and a cartilaginous coalition on the contralateral side [15,21]. The treatment for symptomatic cuboid-navicular coalition varies from conservative [14,18] to surgical treatment [3,13,17,20]. Awan et al reported successful treatment using physical therapy, although the reported follow-up was only 3 months . Several authors have reported their surgical treatment outcomes, with generally good results. Johnson et al. reported failure of conservative treatment including short leg cast immobilization, ultimately progressing to surgical treatment, with the resection of the osseous bar. This was performed through a single lateral curvilinear incision from the inferior aspect of the lateral malleolus to the distal medial aspect of the navicular . Piqueres et al also reported good results following surgical treatment, with 1 year follow-up, and return to previous sports participation with no recurrence of pain . During surgical treatment the resected bone surfaces may be separated using bone wax , adipose tissue , or the extensor digitorum brevis muscle  to avoid coalition recurrence. However, Hounshell reported that donor site morbidity and recipient instability can occur with the use of wax or muscle belly as the interposition spacer and suggested the use of an acellular human dermal regenerative tissue matrix as an acceptable alternative since it was associated with good stability and no regeneration of the bone bar . To our knowledge, the largest surgically-treated case series reported is from Sarage et al., which included four patients aged 15 to 35 years with fibrous coalition who were surgically treated with coalition resection and adipose tissue interposition with good results . The purpose of this case study is to present the radiographic and MRI findings in a patient with asymptomatic cuboid-navicular coalition in the context of symptomatic Achilles tendinosis. MRI is an important diagnostic component of the evaluation of tarsal coalition, especially in the less commonly affected tarsal bones. All authors: Steadman Philippon Research Institute Research Support from: Smith & Nephew Endoscopy, Arthrex, Siemens Medical Solutions, USA, Ossur Americas, Vail Valley Medical Center. Charles P. Ho: Steadman Philippon Research Institute (Research Advisory Committee), Rotation Medical (Consultant). Thomas O. Clanton: Arthrex, Inc. (Consultant/speaker fees, and royalties and in-kind donations of surgical supplies for research), Stryker, Inc. (Consultant/speaker fees and royalties), Steadman Philippon Research Institute (Research Advisory Committee). Moraleda L, Gantsoudes GD, Mubarak SJ. C Sign: Talocalcaneal coalition or flatfoot deformity? J Pediatr Orthop 2014;34:814–9. Kulik SA, Jr., Clanton TO. Tarsal coalition. Foot Ankle Int 1996;17(5):286-96. Johnson TR, Mizel MS, Temple T. Cuboid-navicular tarsal coalition — presentation and treatment: A case report and review of the literature. Foot Ankle Int 2005;26(3):264-6. Kamiya T, Watanabe K, Teramoto A, Yamashita T. Cuboid-navicular tarsal coalition in an adolescent female athlete: A case report. JBJS Case Connect, 2015 Nov 11; 5 (4): e93. Leonard MA. The inheritance of tarsal coalition and its relationship to spastic flat foot. J Bone Joint Surg Br 1974;56b(3):520-6. Herzenberg JE, Goldner JL, Martinez S, Silverman PM. Computerized tomography of talocalcaneal tarsal coalition: A clinical and anatomic study. Foot Ankle 1986;6(6):273-88. Anderson RJ. The presence of an astragalo-scaphoid bone in man. J Anat Physiol 1880;14(Pt 4):452-5. Harris RI, Beath T. Etiology of peroneal spastic flat foot. J Bone Joint Surg Br 1948;30-B(4):624-34. Badgley CE. Coalition of the calcaneus and the navicular. Arch Surg 1927;15:75-88. Newman JS, Newberg AH. Congenital tarsal coalition: multimodality evaluation with emphasis on CT and MR imaging. Radiographics 2000;20(2):321-32; quiz 526-7, 32. Lawrence DA, Rolen MF, Haims AH, Zayour Z, Moukaddam HA. Tarsal coalitions: Radiographic, CT, and MR imaging findings. HSS J 2014;10(2):153-66. Lemley F, Berlet G, Hill K, Philbin T, Isaac B, Lee T. Current concepts review: Tarsal coalition. Foot Ankle Int 2006;27(12):1163-9. Sarage AL, Gambardella GV, Fullem B, Saxena A, Caminear DS. Cuboid-navicular tarsal coalition: Report of a small case series with description of a surgical approach for resection. J Foot Ankle Surg 2012;51(6):783-6. Graham JA, Awan O. The rare cuboid-navicular coalition presenting as chronic foot pain. Case Rep Radiol 2015:1-4. Del Sel JM, Grand NE. Cubo-navicular synostosis; a rare tarsal anomaly. J Bone Joint Surg Br 1959;41-b(1):149. Chu JS, Underriner T, Yegorov A. A rare case of cubonavicular coalition. Radiol Case Rep.
Prado MP, Mendes AA, Olivi R, Amodio DT. Cuboid-navicular tarsal coalition. Rev Bras Ortop 2010;45(5):497-9. Feliu EC. Cubonavicular synostosis. A case report. Acta Orthop Belg 1991;57(3):306-8. Waugh W. Partial cubonavicular coalition as a cause of peroneal spastic flat foot. J Bone Joint Surg Br 1957;39-b(3):520-3. Hounshell CR. Regenerative tissue matrix as an interpositional spacer following excision of a cuboid-navicular tarsal coalition: A case study. J Foot Ankle Surg 2011;50(2):241-4. Piqueres X, de Zabala S, Torrens C, Marin M. Cubonavicular coalition: A case report and literature review. Clin Orthop Relat Res 2002(396):112-4.